The Banfield Pet Hospital, located inside of most PetSmart locations, offers microchip services for both your cat and pet. To find a location, you can do so by clicking here. How much does it cost to microchip a dog or cat at PetSmart? The costs to microchip your dog or cat at a local PetSmart really came down to the location you choose and if you’re an Optimum Wellness Plan member, but from the calls we made, it appeared the costs were mostly the same unless they were offering some sort of promotion at the time. 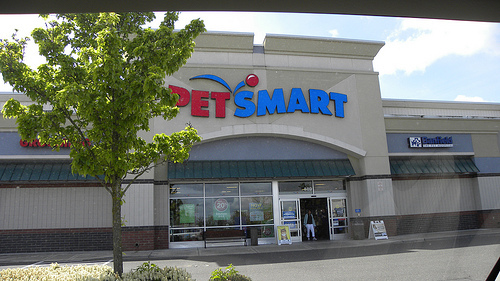 Depending on these promotions, the costs could range anywhere from as little as $35 to about $80, plus an office examination fee in some cases, but to be certain of the costs at the time, we highly recommend you contact your local PetSmart for exact information since Optimum Wellness Plan members, for example, could save up to 20%. For example, at the time of this publishing, we found a $10 off microchip services coupon via the official website, and we also found a free examination for first-time customers as well. Chances are if you’re a first-time customer, you can bypass the exam fee and only pay for the microchip in most cases. Aside from the initial implantation, we did find that there is also an annual fee of about $20, according to some reviewers on Yelp. Again, this couldn’t be confirmed as everyone will experience different plans and price points, so it’s best to visit or call a local location for more information. A microchip is a permanent form of identification, about the size of a grain of rice. Implanted beneath the skin, usually between the shoulder blades, it’s able to store a unique code that can only be detected by a scanner at most shelters and vet offices. This code, when retrieved, is then matched to a pet-recovery database, which will share the pet owner’s contact information, showing them who the pet belongs to. The entire procedure is virtually painless, similar to a vaccination and will take less than seconds as it’s implanted between the shoulder blades. After the chip is implanted, you will then have to create an account with the pet-recovery database the vet used and input your contact information. Since there are multiple brands of microchips on the market, this process can vary, but it’s so important you keep this contact information up-to-date.